Who will be on my surgical team? Will I be in any pain during the operation? What will happen during my surgery? How will my surgical team keep me from getting an infection? Where will I go after my surgery? As your surgery date gets closer, you might feel uneasy. But the more you know about what to expect, the less nervous you'll be. Take a few minutes to learn how the day will unfold. You'll usually be asked to arrive about 2 hours before your operation starts. A registered nurse will greet you and help you prep. You'll discuss with him your medical history and the medicines you take. You'll also get a chance to talk to people on your surgical team about the operation. Before you go to the operating room, you'll first change into a gown. The nurse will remind you to remove things like your jewelry, glasses or contact lenses, hearing aids, or a wig if you have them. A nurse checks your heart rate, temperature, blood pressure, and pulse. The surgeon may mark the spot on your body where the procedure will be done. A nurse places an IV line in your arm so the doctor can give you fluid and medicine during your operation. When it's time for your surgery, you're wheeled into the operating room on a stretcher. Surgeon. This doctor leads the team and does the operation. Surgeons have to complete 4 years of medical school, plus at least 5 years of special training. They also have to pass a national surgical board exam. The one you choose should be experienced in the type of procedure you're having. Anesthesiologist. This doctor gives you medicine that makes you pain-free during surgery. Certified registered nurse anesthetist. He assists your anesthesiologist and monitors you before, during, and after your operation to make sure you get the right amount of pain medicine. Surgical tech. He sets up the tools your surgeon will use and makes sure they're sterile. Operating room nurse. He helps the surgeon during your procedure. For instance, he may pass instruments and supplies during the operation. You'll get medicine, called anesthesia, so that you won't feel anything during surgery. The type you get depends on your health and the procedure you're having. Local anesthesia. It blocks pain in the part of your body where you have surgery. You'll still be awake and alert. Regional anesthesia. You're injected with medicine that numbs the whole area of your body where the surgery takes place. General anesthesia. It puts you to sleep during your operation. You get this type of medicine through an IV in your vein or by breathing into a mask. Once you're in the operating room, you breathe oxygen through a mask. Your anesthesiologist gives you medicine to prevent pain. Before the surgery starts, a nurse cleans your skin with an antiseptic to help prevent infections. He may remove hair from the area and place a sterile drape over your body. It will have an opening in the place where the surgeon will work. Clean their hands and arms up to their elbows with a germ-killing cleaner before the operation. Wear masks, gowns, and gloves. Clean the part of your body where the surgery is being done with a germ-killing soap. Clean and cover the cut afterward. They may also give you antibiotics before your procedure to help prevent an infection. You'll wake up in a recovery room. A nurse checks your heart rate, breathing, and the bandaged area where your procedure was done. He might also ask you to take deep breaths and cough to clear your lungs. You'll stay in the recovery room until you're fully awake and all your medical signs, like blood pressure and heart rate, are stable. How much time you spend there depends on what kind of surgery you had. After that, depending on the type of operation you had, you'll get sent to a hospital room or back home. Either way, you'll be ready to be greeted by your loved ones and begin the road to recovery. Agency for Healthcare Research and Quality: "Surgical site infection: prevention and treatment of surgical site infection." CDC: "FAQs About Surgical Site Infections." Johns Hopkins Medicine: "Types of Anesthesia and Your Anesthesiologist," "The Surgical Team," "What to expect the day of surgery." Kish Health System: "When You Arrive at the Hospital for Surgery." Mount Sinai Hospital: "The Day of Your Surgery." 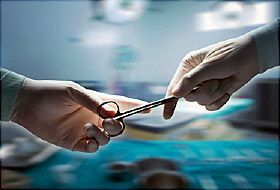 Sutter Health: "Abdominal Surgery: What to Expect While You are in the Hospital." University of Chicago Medicine: "What to Expect When You Have Surgery."